We attended a wonderful Chinese New Year Celebration last night at the home of our friend, neighbor, and Marty’s CSA member, Jenn Atkinson. Lots of delicious Chinese food was served! Here’s one recipe, courtesy of Jenn. More coming soon! 1 Pat the shrimp very dry and place them in a bowl. Toss with the cornstarch. 2 Heat a wok or large frying pan on high heat until a bead of water instantly sizzles and evaporates upon contact. Add the cooking oil and swirl to coat. Add the cornstarch coated shrimp to the wok and spread out in one layer. Let fry untouched for 1 minute. Flip and fry other side for another minute. Remove the shrimp from the frying pan, keeping as much oil in the pan as possible. 3 Return the pan to the stove. Add an additional teaspoon of cooking oil to the pan if needed. When the pan is hot, turn the heat to medium and add the garlic and the ginger and fry for 15-30 seconds until fragrant. 4 Pour in the sauce mixture and bring to boil. Add the cooked shrimp back into the wok and let simmer for an additional minute until the shrimp are cooked through. Serve on bed of shredded lettuce and top with garnish of sliced green onions. 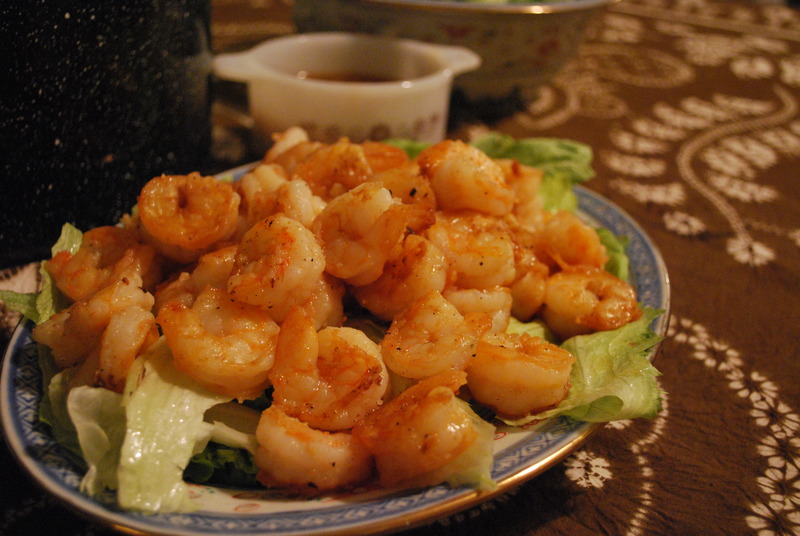 Tags: Chinese New Year, recipes, shrimp, stir fry. Bookmark the permalink. we need some ideas for cabbage — came upon a bag of them and many mini onions (yellow) and a few white potatoes. Already made a curry. any other ideas?